Bridal Veil Falls is not that spectacular by itself. The creek is small, and has its best flow after some good rain. It's a cascade that ends in a free-fall into a ditch filled with boulders and riprap between two roads, so getting a good photo here is a challenge. The free-fall part may actually be man-made by the construction of US Hwy. 64. What's unique about this falls is that you could once drive a car behind them! US Hwy. 64 used to pass behind the falls until it was re-routed in front of the falls for safety. Dripping water would freeze into solid ice on the road in winter, and falling ice and rock blocking the road were common. 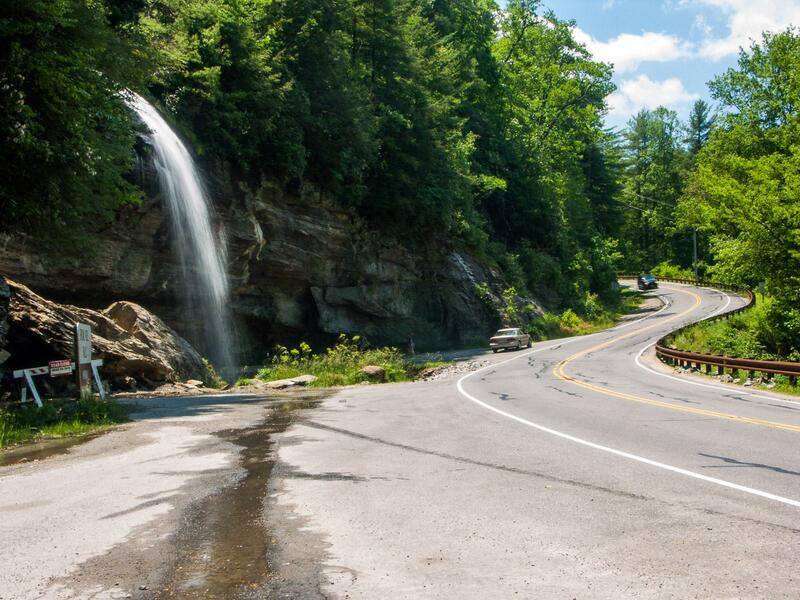 US-64 was re-routed in front of the falls, leaving a small loop of road behind the falls for people to travel. The danger here was effectively illustrated in December 2003 when an enormous chunk of rock fell onto the old road from above, blocking it. 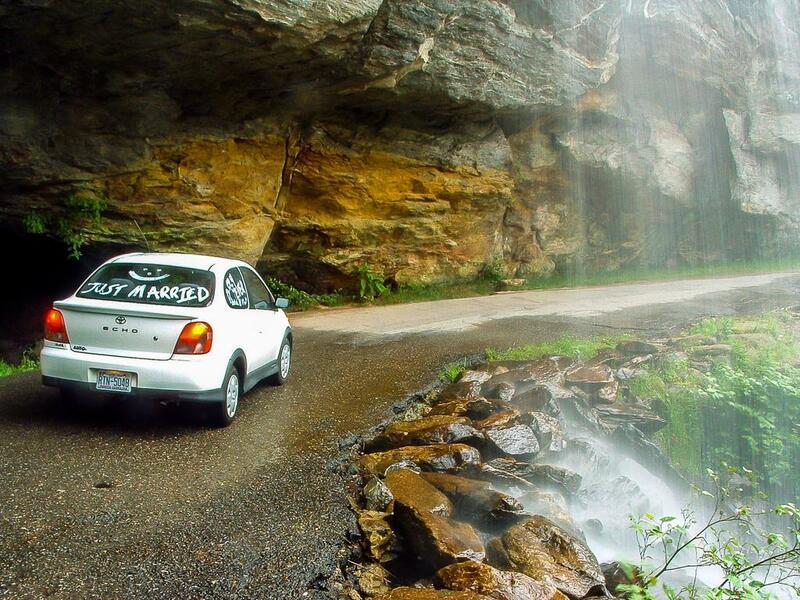 Driving behind Bridal Veil Falls. That rock has since been removed, but the road is now closed to vehicles for safety reasons - permanently, it appears. There is enough room to park and view the falls from either side of the barricades. From the intersection of US Hwy. 64 and NC Hwy. 28 in Highlands, drive 2.6 miles West on 64 to the falls on the right. It's 14.4 miles East on 64 from the US 64/US 441 Bypass intersection in Franklin. There's no trail, but if the little spur of road is closed, you can park just west of the falls in another pull-off and walk on the loop. Be careful - the afternoon sun can cause falling ice in winter, and rocks are known to fall as well, especially after freeze/thaw in winter.